for the telescopic mast sections in forklifts and related machines. The bores of mast guide bearings are fitted, as with any standard industrial bearing. acts directly against a steel mast rail. as well as high intermittent shock loads. 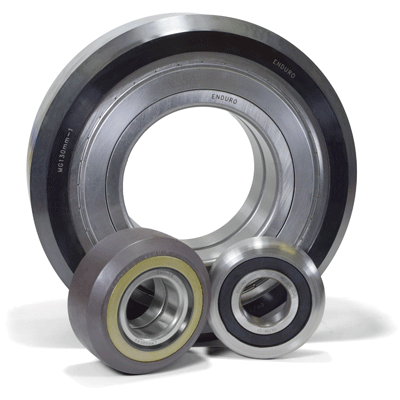 Mast guide bearings are intended for low speed, high load applications. The seals are very tight fitting. The grease fill is very high, typically over 90%. The internal design (ball and roller complements) maximizes the load capacity. Enduro mast guide bearings are available in by far the widest range of sizes of any brand. Our cross reference program covers part numbers made by RBC, McGill, INA, BCA, MRC, NTN, NSK, Koyo/HIC, and others. We can offer replacement bearings for lift trucks long out of production. Contact our distributor with any competitor's part number or size; we have what you need. OE customers can make good use of Enduro's mast guide program. The entire stock catalog is available for design review. Additionally, we offer tremendous flexibility for new designs, or variations of existing designs. In addition to standard bearing steel, we have made mast guide bearings in stainless and high heat steels. We can also offer corrosion resistant coatings, such as black oxide, black phosphate, and galvanized. We offer a variety of high quality grease best suited to your application from Shell, LE and other leading companies. We can make entirely new sizes and designs, for very low minimum quantities, with quick lead times.